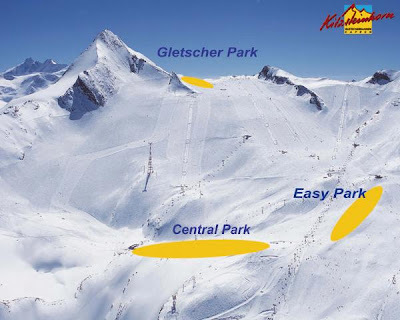 Official:-the Kitzsteinhorn in Austria has the best snow park in Europe? The influential German motoring organisation 'ADAC SKI edition' with a circulation of 90,000 issues, is an important tourism magazines for the winter ski sports. The editors of the magazine have chosen 55 ski areas from more 700 skiing areas and compared them critically. The result of the survey shows that Kaprun -Zell am See, the Europa Ski area has won an accolade again and left some of the other European competitors behind in the ratings. The judging panel consisted of tourism professionals, journalists and sportspeople they carried out an audit to see what the holiday destinations have to offer, areas they looked at include :- resort facilities, slopes, skiing and après-ski. Kaprun - Zell am See- came first in the category for Mellow Park Snowpark one of three snow parks on Kitzsteinhorn glacier above Kaprun, making it the top skiing snow park area for the year 2009 in Europe! The Mellow Park snowpark has beaten the resorts from the France, Italy, Switzerland and come out best across Europe and in Austria! quite a accolade! The ADAC Ski magazine article states:- 'The jury is convinced that Kitzsteinhorn in the province of Salzburg has the best snow park in the Alps.' It goes on to say that the continuous improvements of the parks has created 'perfect conditions for snowboarders and freeskiers'. This result gives the region of Europa Ski area of Zell am See-Kaprun a top position for the second time in a row in the survey. Last year in 2008 the judges from the Adac Ski travel magazine had chosen Kaprun -Zell am See as the 'Climber of the year'. See for your self the snowparks on the Kitzsteinhorn. Zell am See family friendly claim. The area has also been accoladed by the German publisher Falk voted the Zell am See - Kaprun area the "most family - friendly holiday destination" in Europe! With the mix of mountains, lake, trains, castles, palaces, numerous sport and activity opportunities, we think you will agree with the recommendation. The area is ideally suited for family holidays throughout the year what ever the ages. In the summer we would also highly recommend the purchase of the Salzburgerland Card, which at just under 120 Euros, gives a family of four, 6 days of access to over 190 attractions, which includes mountain lifts, spas, castles, stately homes, swimming pools etc. making it great value. To find out more about the area, please read some further articles or have a look art our website at Kaprun luxury apartment holidays.